This is a mixed lot of 26 Amazing Spider-Man Comic books. This is a low grade lot with some major keys. Many are complete and many like the ASM 3's for obvious pin-up page reasons are incomplete. But still worth a penny. We have 2 copies of Amazing Spider-Man #1 Coverless! First Spider-Sense, First J Jonah Jameson, Chameleon, Second Spider-Man/ Peter Parker, Aunt may and Origin Retold! One is missing the pinup the other is not, they both lie flat and despite some minor spine wear, the book is VERY well held together, and the interior is immaculately clean. We have 8 copies of ASM 3, two are complete with covers, the other 6 are just missing the pin-up, not damage to the stories or any other major defects. First Appearance of Doctor Octopus! 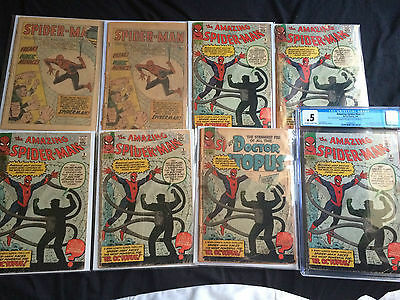 4 copies of ASM #4, all complete, 3 are simply coverless and is the first Appearance of the Sandman, and Betty Brant. Two ASM 5s complete with little defects besides the covers, first time Doctor Doom makes an appearance outside Fantastic Four! 5 ASM 6's all complete, 3 are coverless, the rest have partial covers missing, but that's the only major defect. First Appearance of the Lizard! 2 ASM 9's, one has quite the scuffing on the cover, but is very well held together, and is very pleasant to have as a low grade reader copy the page quality is nice and the book lies flat (as do the rest of the books). The Other copy is the most low grade book here. It's complete, but is VERY brittle. First Electro! Then we have 2 coverless copies of ASM #14, the first Appearance of the Green Goblin. These coverless copies are basically flawless, they're complete, and very tightly bound! And we also have an Annual #1, the first Sinister 6, it's missing the back cover. This is a great lot for any spider-man fan that'd like KEY issues to add to the collection. Or just reader copies or place holder copies. Amazing Spider-Man #1 #3 #4 #5 #6 #9 #14 LOT Steve Ditko Stan Lee Silver-Age Marvel Comics! !